Exploring Beekeeping - May 9, 2019 9:00 a.m. - 12:00 p.m. If you are interested in keeping honey bees, but not yet sure how to start, this class is for you. After taking this course, you will be able to make a well-informed decision about keeping bees in your backyard. Beekeeping classes are held at South Coast Research and Extension Center unless otherwise indicated. Please register in advance. Some classes require a fee and we are not equipped to accept credit card charges at the site. 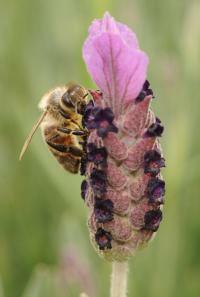 Be aware that not all cities allow beekeeping in urban areas and some cities may require a permit. Check with your city for current regulations. At times, bees can swarm in places where they can cause problems. Swarms can be temporary, which happens when bees leave their old hive and search for a new place to live. In that case, you can just wait a few days for them to leave. What steps can you take if they don't? Got a Question about Bees? Please contact us.